One of the joys of reviewing and researching aerial photographs of our community is that there is usually quite of lot of area covered in each image and usually in quite good detail. Your eye is drawn into the image and you start to make out quite a lot of details. This image is not a photo but an artist’s drawing of a bird’s eye view of Milton. This image was used in an 1894 sale catalogue when the land around the railway station was being auctioned off. You have to make allowances for artistic licence but the Railways station and surrounding buildings are drawn fairly accurately. 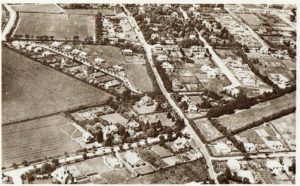 It is possible to identify Station Road and the cross roads with what is now Ashley road and Old Milton Road. Interestingly the artist has depicted the view all the way to the coast line and beyond to the Isle of Wight. 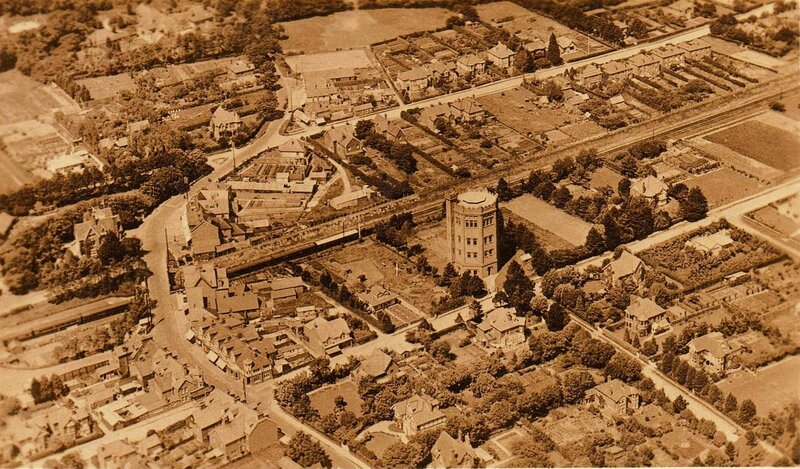 In this 1925 postmarked image the observer can clearly see the water tower which was built in 1900 and the top end of Station Road. On the other side of the railway line Manor Road stands out as a landmark. Following Station Road to the north and you can see on the junction with Avenue Road, and the Broadway and Manor Road a large house with a turret. This was called Ivy bank. Further up the road you will notice on the right the New Milton Garage run by Mr Harry Fagan. This later became Cooper Garage before it was sold in the 1980s and the site developed for housing. This photo of the southern end of Station Road was taken in the mid 1920s. It shows how little development there was in this area at that time. There is a field where Bradbeers and the Post Office sporting office is currently situated. You can make out the new development of Elm Avenue with its bungalows and new planted trees lining the street. 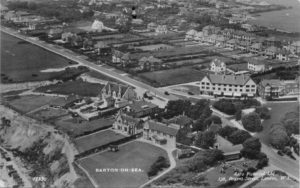 Note also Barton Court Road with just a few houses built near to the junction of Station Road but otherwise consisting of fields. 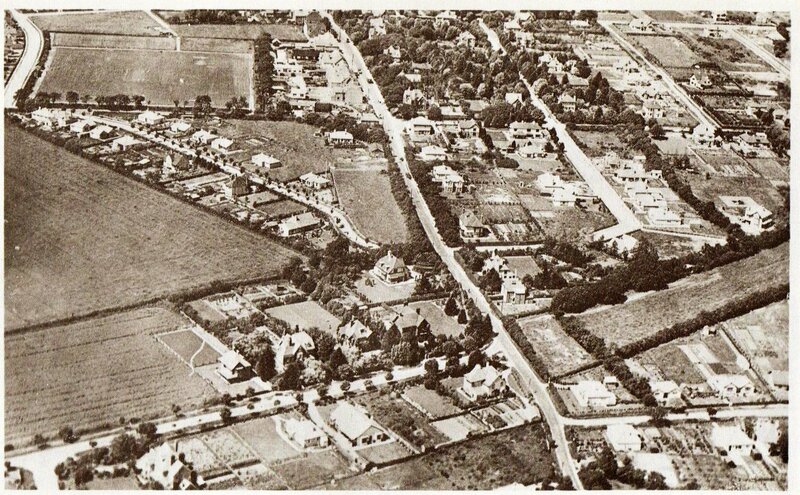 This view of New Milton taken in the late 1940s clearly shows the development of the town centre when compared to the earlier photograph. This image shows the southern half of Station Road in detail. Note that Bradbeers has not yet had the second floor extension. 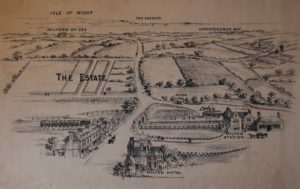 Stationary House, which is home to New Forest Stationers near the traffic lights, has not yet been built. There is a large oak tree on the plot. Robert Adlards builders merchants is clearly visible in Old Milton Road next to the war memorial recreation ground. 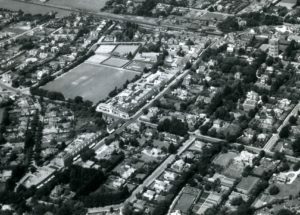 Note the large houses on the east side of Station Road north or the cross roads. These were being used as Dentists and Doctors surgeries. This photograph is postmarked 28th of July 1938. 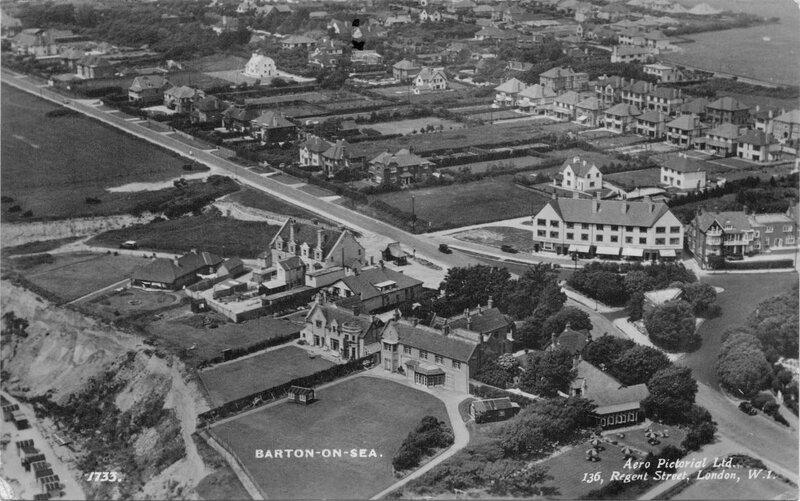 It shows the Barton Court Hotel and the nearby cafe building still in use today and now named the Beachcomber. Next to the parade of shops is the Red House Hotel at the top end of Barton Court Avenue. This hotel was developed out of two large house with an additional construction joining the two buildings together. In this photograph you can clearly see how much of the cliff top has been lost to cliff slippage. Most if not all the garden of the Barton Court hotel is now in the sea. 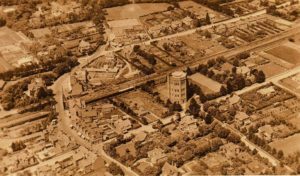 By careful study of these aerial images it is quite easy to see how our home town has developed in quite a short space of time.